Bio-Ag carries, Norman's Naturals, dog food that is great for your dog's health and tastes great! To learn more about Norman’s Naturals dog food including nutritional and ingredient information follow the link to the dog food. 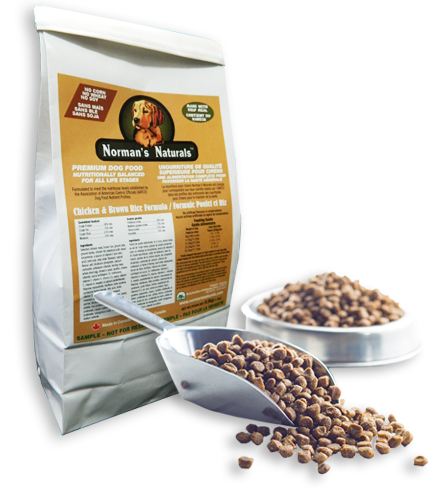 Norman’s Naturals Poultry and Brown Rice Dog Food is a healthy choice for your dog. This unique chicken and brown rice dog food includes high-quality products and ingredients that Bio-Ag Consultants and Distributors Inc. promote for all of their agricultural nutritional formulas. Norman’s Naturals Chicken and Brown Rice Dog Food comes in an 8kg and 18kg bag sizes and contains no artificial preservatives or artificial flavours. It contains no corn, no wheat & no soy, and is made with Kelp Meal. Norman’s Naturals Dog Food is formulated to meet the nutritional levels established by the Association of American Feed Control Officials [AAFCO] dog food nutrient profiles. Naturally balanced for all stages of life, Norman’s Naturals Dog Food is a great choice for your dog. You love your dog, so show them by feeding them Norman’s Naturals Dog Food. You won’t ever look back!